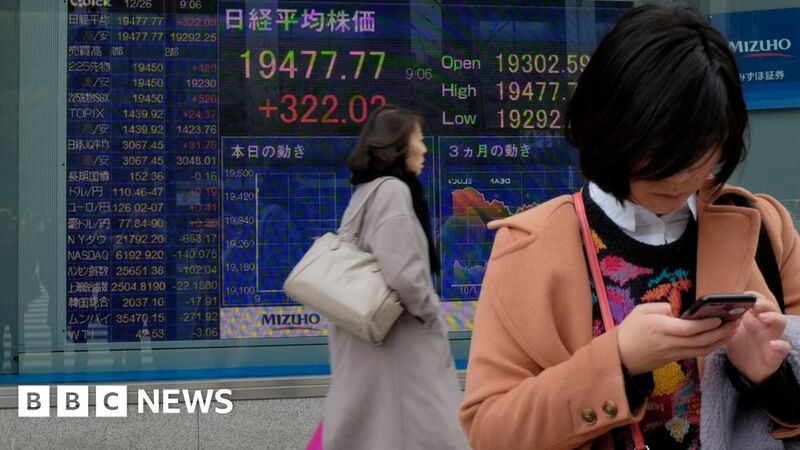 Asian stocks sank on Monday amid growing concerns of a slowdown in the global economy. Investors dumped stocks in favour of safer bonds, driving Japan’s Nikkei index down more than 3%. The losses in Asia tracked a global stock sell-off on Friday, fuelled by downbeat data and a cautious Federal Reserve. Unusual moves in the US bond market have also raised concerns about a possible US recession. Japan’s benchmark Nikkei 225 index dropped 3.1% to 20,948.37. In China, Hong Kong’s Hang Seng index fell 1.6% and the Shanghai Composite lost 1% in afternoon trading. Downbeat data from the US and Europe, combined with a cautious tone from the Federal Reserve, frightened investors last week. The first inversion in the US bond yield curve since 2007 also heightened concerns, by raising fears of a recession in the world’s largest economy. The bonds, known as Treasuries in the US, are issued as a form of borrowing by governments to fund spending. For the first time in more than 10 years, the rate of return (yield) on three-month US bonds rose above 10-year yields, something which is seen as an indicator that a recession could be coming.